Sometimes when I am alone, I indulge in an old habit from my younger days. I feel somewhat silly revealing this, but hopefully you will understand that I need to come out of the closet about this activity. It’s not really harmful to anyone, but it’s not that productive either. Anyway, here’s the big secret. Drumroll, please. I like to color. With crayons in coloring books, or with colored pencils on smooth paper. And it is coloring, not drawing, because I can’t draw worth a darn. Even my stick people look peculiar. In my defense, my mother made me do it. Well, not exactly made me do it, but she used to color a lot too, so you might say she set a bad example. I knew we had a genetic predisposition to coloring when out of the blue, my oldest started bringing coloring books and crayons to her skating competitions. At the age of 16 on. I fear she may have corrupted several of her competitors. I know, I should never have stopped to pick it up, much less opened it to gaze at the untouched crayons, uniform in shape, but promising a bounty of colors. Pine Green, Sky Blue, Sea Green…I didn’t need to pull them out to recognize them. And of course the magically shiny Copper, Silver, and Gold. I stood there, undecided, for a few moments, mentally reorganizing them the way I preferred. (I always color coded mine by labels…browns, oranges, yellow, reds, greens & blues together.) I inhaled. That’s what did me in. 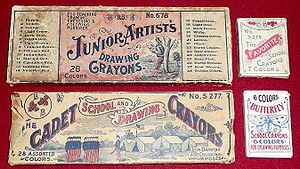 The waxy, cool scent of fresh crayon. Next thing I knew I was smiling sheepishly at the cashier as I handed over the box, a Barbie coloring book, my floss and a token package of pens. “I have a niece visiting,” I explained. Both of my nieces live in the same city I do, and one was 18 at the time. Curse that slippery slope anyway. At the moment, I’m crayon-less but I’ve been playing with colored pencils, printing out sayings that inspire me and coloring them in, all on the sly. In my defense, it does make me feel a lot better. What do you do when you need an activity to soothe yourself with that isn’t reading? Colors? Needlework of some kind? Journaling? When I first started reading your article, I tittered a bit, you being a grown woman, though by the end, I realized you might like taking an adult art class; Who knows? The experience could spark a dashing artist character in your next novel. For myself, I find Kit Kats very soothing. Then again, wine is also pretty good. Crayons? Not so much here, though I do have plenty of acrylic paints. I’m pretty sure I haven’t got the abilities for even a basic art class, Mary Jo…but I DO find Kit Kats and wine soothing. Except when I mix them with crayons, I get wax in my teeth. Oh my it’s confession time. I still love to color but I’ve taken in one step further. I love love love paper dolls. I used to submit designs to the Katy Keene comics to dress those lovely ladies. I had a couple published when I was young. (No mom, didn’t keep the comic books) BUT I have returned to that. There is a magazine called the paper doll studio, devoted to grownups like me who still love to draw doll dresses. I’ve had two dresses published by them this year. My first two were black and white. My next submission will be colored! I love it. I usually draw all of my heroines in at least one of the outfits they wear in my books.